The letter I in the ICAO spelling alphabet. 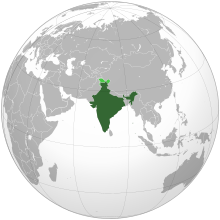 A map of the Republic of India, with claims in light green. From Old English India, Indea, from Latin India, from Ancient Greek Ἰνδία (Indía), from Ancient Greek Ἰνδός (Indós, “Indus river”), from Old Persian 𐏃𐎡𐎯𐎢𐏁 (hindūš), from Proto-Iranian *hínduš, from Proto-Indo-Iranian *síndʰuš (“river”), of uncertain origin. Compare Middle English Inde and Ynde from Old French Ynde (original form started to prevail in the 16th century), Persian هند‎ (hend, “India”), Sanskrit सिन्धु (síndhu, “a river, stream”). A country in South Asia, official name Republic of India. (chiefly historical, proscribed in modern use) An area of land in Southern Asia, traditionally delimited by the Himalayas and the Indus river; the Indian subcontinent. (historical, often "British India") A territory of the British Empire, chiefly comprising the modern day countries of India, Pakistan, Bangladesh, Bhutan, Nepal and Burma. When discussing the pre-modern history of South Asia, naming the entire subcontinent India is common. For discussing the current states, which include the Republic of India, this can cause offense and confusion and is usually avoided with the terms Indian Subcontinent or South Asia. At times when multiple countries existed in South Asia, these have sometimes been pluralised as Indias or Indies. The word Indies survives in some place names such as East Indies and West Indies but is otherwise obsolete. From Latin India, from Ancient Greek Ἰνδία (Indía), from Ἰνδός (Indós, “Indus River”), from Old Persian 𐏃𐎡𐎯𐎢𐏁 (hindūš) (Persian هند‎ (Hend)) from Sanskrit सिन्धु (síndhu, “a river, stream”). “India” in New English-Irish Dictionary by Foras na Gaeilge. Entries containing “India” in English-Irish Dictionary, An Gúm, 1959, by Tomás de Bhaldraithe. Borrowed from Ancient Greek Ἰνδία (Indía), from Ancient Greek Ἰνδός (Indós, “the Indus river”), from Old Persian 𐏃𐎡𐎯𐎢𐏁 (hindūš), from Proto-Iranian *hínduš, from Proto-Indo-Iranian *síndʰuš (“river”), of uncertain origin. From Latin India, from Ancient Greek Ἰνδία (Indía), from Ἰνδός (Indós, “Indus River”), from Old Persian 𐏃𐎡𐎯𐎢𐏁 (hindūš) (modern Persian هند‎ (Hend)) from Sanskrit सिन्धु (síndhu, “a river, stream”).